UPDATE! We are giving away Auto Show tickets all this week! Make sure to check out the Eagle Ridge GM Facebook and Twitter pages to find out how. Draws everyday this week. Good luck! Auto enthusiasts are buzzing this week over the upcoming Vancouver International Auto Show (VIAS)! 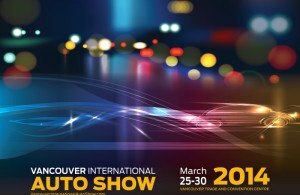 The show runs from March 25-30, 2014 at the Vancouver Convention Centre and highlights the best the industry has to offer with the latest and greatest models, prototypes, technology, parts and accessories. Whether you are looking for a new vehicle or keen to see what the latest automotive trends are, the VIAS is sure to be a hit! With dozens of automakers on hand, there will be no shortage of things to see and do. No matter which manufacturer you most adore, it is always fun to wander the exhibitors to see what else is on the market. You may even find yourself falling in love with a different brand or vehicle. Of particular excitement for us is getting to see the 2014 GM lineup, including the redesigned Silverado and Sierra trucks, Corvette, Impala and Cruze Turbo Diesel. Each of these vehicles has received high praise and it will be exciting to see then demonstrated in our own backyard. You will also get a chance to compare them next to other makes and models to see how extraordinary they really are. You may also enjoy the driving simulators, live public auction, “Green Ride and Drive”, and the Exotics, which has some rare offerings from Ferrari, Maserati, Lamborghini and more. You can also leave the kids in the Children’s Playcare Centre, where they will be looked after by qualified professionals, allowing you to browse the show without worry. Tickets for the auto show can be purchased online or at the door and the show runs until 10pm each evening, with the opening time varying depending upon the day. Check out the VAIS website for more information. Once you have visited the auto show, come down to Eagle Ridge GM for a test drive of some of the best 2014 models!